Master Chief Michael Stevens presented Gary Sinise with his honorary chief’s cover Aug. 24 at the Navy Memorial in Washington. Navy photo. 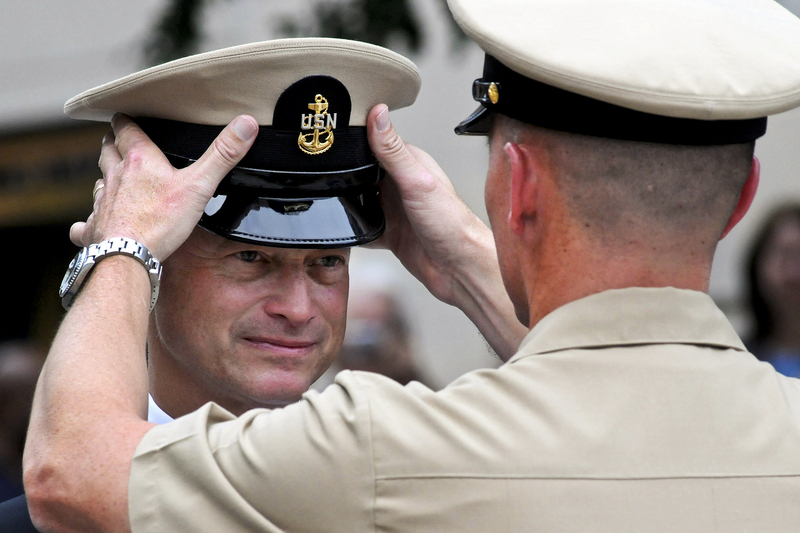 Military supporter and actor Gary Sinise became an honorary chief petty officer during a ceremony at the Navy Memorial in Washington on Aug. 24. Fleet Master Chief (AW/NAC) Michael Stevens, next in line to be Master Chief Petty Officer of the Navy, presented Sinise with his chief’s cover, according to a Navy release. The “CSI:NY” star is best known for his role as Lt. Dan in “Forrest Gump.” He also plays lead guitar in the Lt. Dan Band. In addition to volunteering with the USO, Sinise also founded the Gary Sinise Foundation, which creates programs to entertain, educate, inspire and strengthen servicemembers, according to the foundation’s website. Now are they going to bring back CSI New York?? Welcome Gary! A job well done, brother. I think I’m going to write him in for president…. I’m having trouble with the other two but I sure as in hell like Gary and his politics. Bravo Zulu to you Gary, You deserve it! Thank you for supporting our military the way you do. You have set a fine example for others to follow. Welcome to the goat locker! God Speed, and our complements to the Judge! Good job. A well-deserved honor. Carry on. Welcome to the goat locker! WTF??? He doesn’t even do recruiting commercials for the Navy. He does them for the Army. Let them give him a meritorious advancement. The Navy has really gone down hill, I’m glad I’m retired. Mr. Sinise has always seemed to be a man of honor, respect, with morals and values, a far cry from how most “stars” in Hollywood act. He has class that shows. Gary, you ROCK! Looks like Lt Dan got promoted to CPO! Good for him.